What was once a potential Kindle-killer is now playing catch-up. Rakuten Kobo’s latest e-reader, the Kobo Aura One Limited Edition, looks identical to the year-old Kobo Aura One. 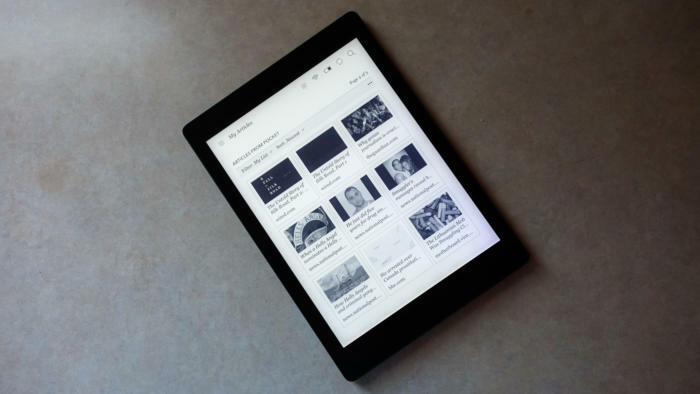 But with 32GB of storage and a few new software tricks up its sleeve, it’s designed to go blow-for-blow with Amazon’s outstanding 2017 Kindle Oasis. While it isn’t quite up to the task, it still has a lot to offer certain readers. The Kobo Aura One Limited Edition’s not cheap. At $280 from Rakuten Kobo, it costs as much as Amazon’s 32GB Kindle Oasis with “Special Offers” (ads at the bottom of the screen) and $50 more than Kobo’s original Aura One. Those willing to pay the premium will be rewarded with 32GB of storage, four times the amount that the original Aura One provides. For readers of traditional ebooks, this is overkill—8GB of storage can already hold thousands of titles. However, if your reading branches out to PDFs, digital comic books, manga, or other large files, a huge bump in storage like this could be a compelling upgrade. Don’t get carried away, though. Electronic readers tend to be low-powered devices, lasting weeks off of a single charge. Performance takes a backseat as a result, and it shows in how most e-readers struggle to compile larger catalogs. Whenever I've tried to load all 2,400 ebooks in my personal collection onto any of the e-readers I’ve tested or owned, the device has crashed or slowed down to the point of being unusable. So while Kobo claims the Limited Edition is capable of storing around 28,000 ebooks or 700 graphic novels, you’ll not want to push it. Outside of the Limited Edition’s increased storage capacity, there’s no difference in its design compared to a regular Aura One. Both devices weigh 8.1 ounces and measure 7.7 x 5.5 x 0.3 inches in size. Like the original Aura One, the Limited Edition is waterproof. With an IPX8 rating, it can survive in up to 6.5 feet of water for up to an hour at a time. This was a killer feature in 2016, when Amazon’s Kindle Oasis wasn’t designed to survive a single splash. But this is 2017, and Amazon’s played a lot of catch-up in the past year, including waterproofing the latest Kindle Oasis. The Aura One Limited Edition offers one of the best Pocket reading experiences around. Having lost that differentiator, the Limited Edition struggles to keep up with the 2017 Oasis. The Oasis has a tough aluminum exterior, while the Aura One Limited Edition’s case is mere plastic. For around $20 more than the Limited Edition, you can get the 32GB, ad-free iteration of the 2017 Kindle Oasis. And while Kobo’s ebook offerings have expanded in the past year or so, the company’s online store still can’t match the huge amount of content that Amazon users enjoy. It’s not all content doom and gloom for Limited Edition users, though. Owners of the device can use Raktuken Kobo’s OverDrive service, which provides on-demand access to thousands of free ebooks from participating libraries worldwide. For users of Pocket’s web clipping services for smartphone or PC, the Limited Edition packs an excellent Pocket integration for reading your saved content. 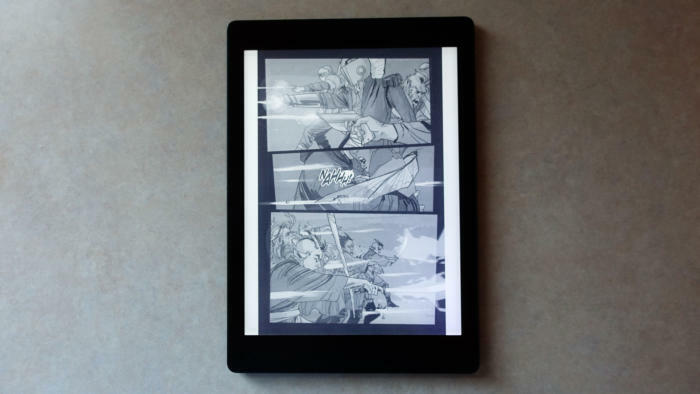 The Aura One Limited Edition’s 300-dpi resolution makes reading comics and manga a pleasure. 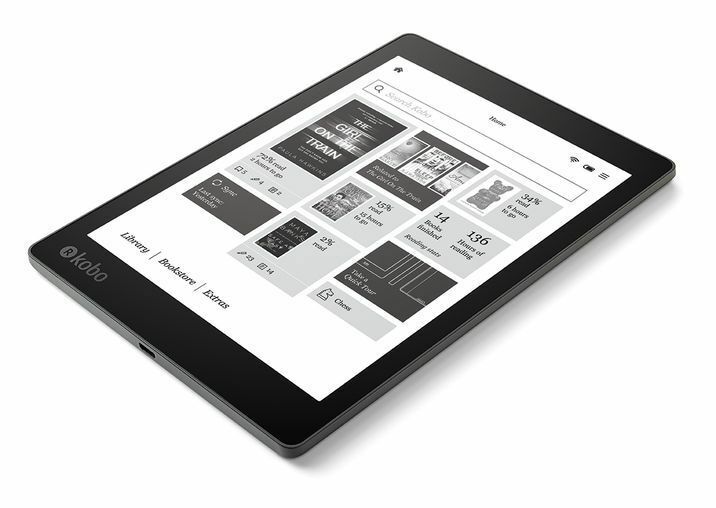 The Limited Edition has a 7.8-inch HD Carta E Ink touchscreen, the second-largest E Ink display that we’ve tested. With a 300-dpi resolution, text, black-and-white and grayscale images look as crisp as they do on a printed page. This makes the Limited Edition, as promised, a great choice for reading comic books or manga. For traditional book-lovers, more screen real estate means more words per page, and therefore fewer page turns. 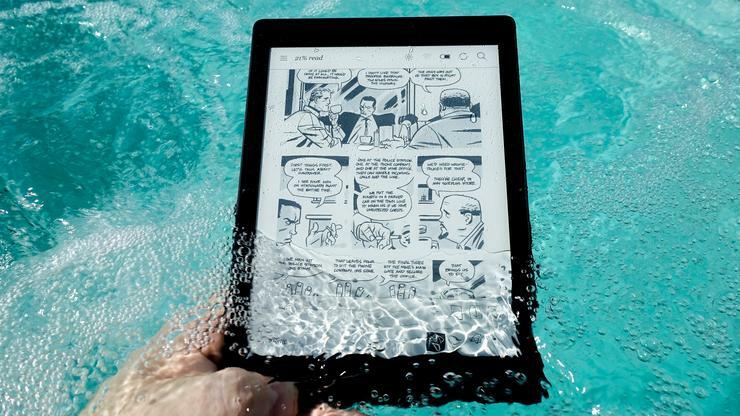 In an attempt to create a superior reading experience for graphic novel enthusiasts, Kobo gave the e-reader new software capabilities that make scanning around the pages of a image-heavy book faster. Rakuten says this feature is exclusive to the Limited Edition, but there’s no reason it couldn’t be rolled out to other hardware in a future firmware update. I found the Limited Edition’s display easy to see in all lighting conditions. Even under intense artificial or natural light, the display’s matte finish keeps your page readable. In dim lighting conditions, the Limited Edition’s ComfortLight Pro front lighting illuminates its display with white or orange-colored LEDs, which help to eliminate eyestrain. I found the lighting to be adequate, though at higher illumination levels it made the display a little hazy, and not as evenly lit compared to the 2017 Kindle Oasis. When the Kobo Aura One was released in 2016, with its large, bright display and exclusives like Pocket and OverDrive integration, it had the potential to be a Kindle-killer. It was a flagship device that cost less and arguably did more than Amazon’s Kindle Oasis. In 2017, however, the Kindle Oasis has caught up, and the Limited Edition has little new to offer. Unless you’re tied into Kobo’s ebook ecosystem, or resisting the inexorable pull of Amazon, the excellent 2017 Kindle Oasis is likely your better bet for a premium reading experience.